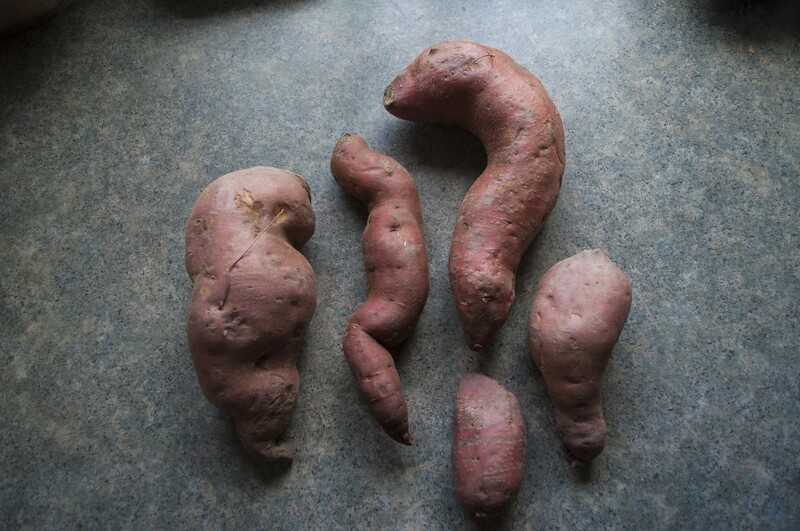 What to do with sweet potatoes? This year, my family decided to do a potluck Thanksgiving meal. But rather than leave it to chance, my aunt and uncle assigned everyone a dish or two to bring. I lucked out and got sweet potatoes. Just kidding, I hate sweet potatoes. I'm much more into savory than sweet, and, for whatever reason, my cold northern blood curdles at the idea of spooning flabby, orange, molasses-soaked mash into my mouth. But after about a week of stewing, I decided not to make a stink about it. I'd just find a way to make a sweet potato even I could love. Discovering that a few local farms are growing several varieties helped significantly. And remembering that sweet potatoes have been a key part of the Indian diet for centuries helped, too. So I bought five-ish pounds of peach-colored spuds from Burnt Rock Farm in Huntington and had at them with a lot of Eastern-looking spices and a sweet-salty blend of fats. Now, with two days until Thanksgiving, I've got one less thing to worry about. 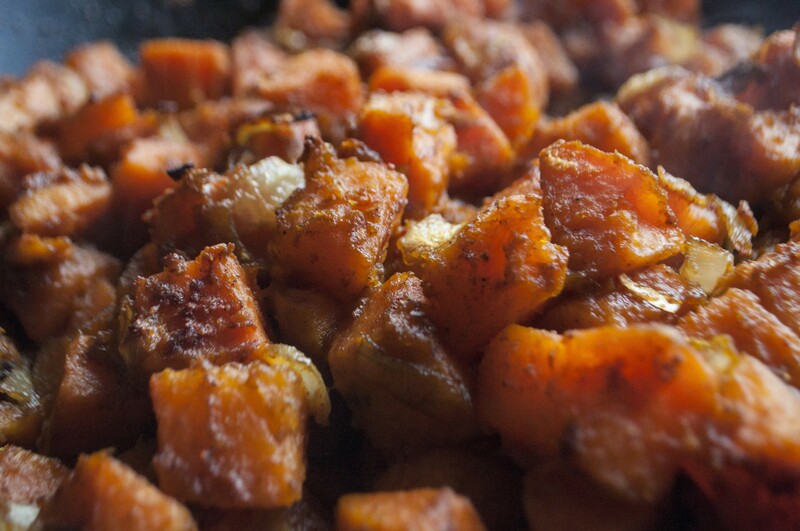 When it comes to sweet potatoes, a bit of salt and spice makes everything nice! Preheat oven to 400 degrees and place a rack toward the top of the oven. As you peel and cut the potatoes, season water with one or more teaspoons of salt and set to boil in a large saucepan. Once cut to size, boil the potatoes in the salted water for 10 minutes, until they begin to soften slightly. Drain and reserve. In a large, cast-iron skillet over medium heat, sweat the garlic and onion in all three of the fats, stirring often, for about five minutes. Add all the spices and cook another 10 minutes, until the onions begin to brown. Turn off the heat under the skillet and add the boiled potatoes. Mix the maple syrup with 1 1/2 teaspoons of salt. Drizzle this over the potatoes in the skillet, tossing everything together gently but thoroughly.